Exciting introduction to robotics through building models and using a computer to program the models’ behavior. 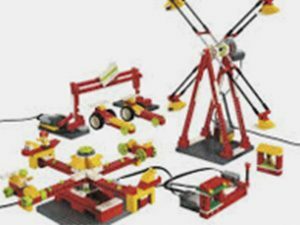 Our models include ferris wheel, race car, merry-go-round, crane, various animals and more. Building models will improve spatial cognition and visulaization abilities. Programming encourages students to think logically to produce a specific action. Students will also learn about simple engineering concepts such as pulleys, belts, gears and levels, while having a blast.